Overland Park and Kansas City’s dining scenes aren’t just attracting attention from hungry travelers; several of the area’s talented, innovative and expertly trained chefs have achieved acclaim, including numerous James Beard Foundation nominations and awards. If you love fried chicken, legendary restaurant Stroud’s Overland Park should be at the top of your dining to-do list! Not only is the restaurant known for its mouthwatering pan-fried chicken and generous side dishes served family style, it’s also a James Beard award winner in the America’s Regional Classics category. Simon Majumdar, Food Network’s “toughest critic,” said Stroud’s chicken would be his last meal. You’ve got to taste it to believe it—and don’t forget to end your meal with some of the restaurant’s beloved cinnamon rolls! Pastry chef Megan Garrelts, a James Beard nominee; and her husband, chef Colby Garrelts, a James Beard winner for Best Chef: Midwest, run two restaurants in the Kansas City area: the James Beard award-winning Bluestem, and Leawood’s Rye, which is where Megan received her Best Pastry Chef nomination. 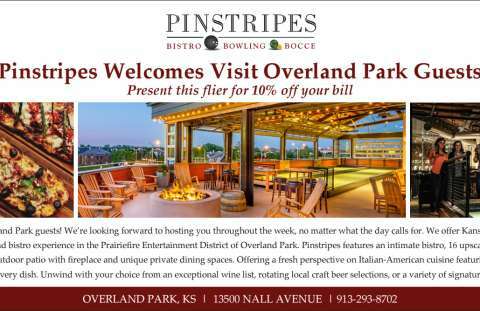 Bluestem is consistently among the top destinations for upscale dining in Kansas City, thanks to a modern yet luxurious interior; impeccable service; and a menu of progressive American cuisine that will leave an indelible impression not just on your taste buds, but also your memory. Head to The Rieger Hotel Grill & Exchange and you can enjoy two acclaimed experiences in one. Located in (and named for) the historic hotel, The Rieger is led by James Beard-nominated chef Howard Hanna, who draws consistent crowds for a menu of classic, expertly prepared dishes that make delicious use of seasonal flavors and ingredients. Downstairs, you’ll find Manifesto, a dark and delightful cocktail lounge that captures the experience of an historic speakeasy. The seasonal cocktail menu is, simply put, a delight—a blend of classic and unexpected liquors enhanced with ingredients that range from fresh herbs and spices to fruit and maple syrup. Pro tip? Manifesto only seats about 40 guests, so visit the website for details on how to reserve a table via text message.